From the July 10, 1913 issue of the North Vernon Plain Dealer and Republican - no author mentioned. Picture taken 1952 or 1953. 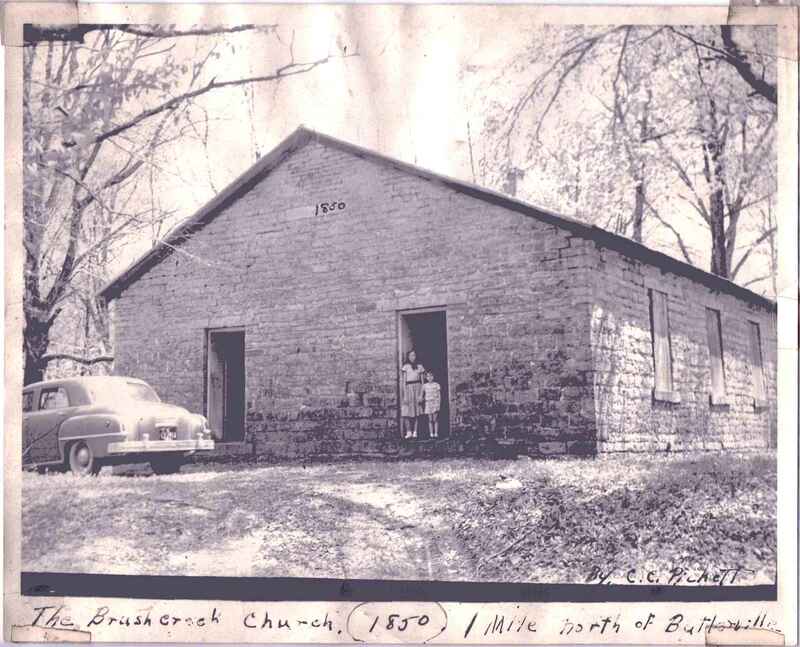 The Brush Creek Baptist Church was organized on the first Saturday in June 1836, (Now 77 years ago) at a log school house which stood about one hundred yeards southwest of the present church building, 2 1/2 miles north of Butlerville, Ind. The constituent members were; Moses P. and Mary Chaille; James, Annie and Mary Ann Davis; Rhoda Prather; Sarah Denton and Jasper H. Grinstead The church met once a month at the school-house until the summer of 1841, when a new log school-house was built, where the cemetery now is. The meetings were held in this building until 1849, when it was consumed by fire. The church immediately began work on the present stone building, which is 35 by 45 ft. in dimention, meanwhile holding their regular meeting at neighboring houses, most frequently at James Davis' and Seth Stratton's. The first services in the new building were in May, 1850, though the structure was not completed for some two years. The following pastors had charge of this church from its organization until 1875; Jno. Vawter, one year; Caleb Moncrief, at intervals, about six yrs. ; Benj. Tucker, three yrs. ; Wm. Vawter, two yrs. ; Isaac Christie, four yrs. ; Jacob M. Cox, one yr.; Jno. Chambers, three yrs. ; Wm. T. Stott, Sr., about ten yrs. ; Johnathan Allee, one yr.; Nelson Johnson, one yr.; F.M. Huckleberry, two yrs. ; John Stott, two years. Since 1875, the following pastors have served for varying lengths of time: J.W. McCoy, J.W. Waters, Johathan Allee, J.C. Remey, Wm. Hogg, N. Smith, J.H. Blankenship, J.M. Osborn, H.N. Spears, E.E. Connelly, Peter Long. J.M. Osborn was recalled and was present in May, 1989. There is no further record of any preaching. The reports show that Rev. Hogg died while pastor, following a revival, and that Rev. Gorbett baptised the converts. The Sandcreek Association held its last session with this church in 1877, with A. Carter, Moderator and B.F. Gaston, Clerk. In 1895, T.J. Stratton, Miles McCaulou and Jon. Sporleder were elected as trustees; the first named is now deceased, the others yet serve as trustees of the property. In the early days of the church it was greatly helped and encouraged, by Andrew Baker, Chesley Woodard, Archie Smith, M.C. Edwards and others. Since 1876, pastors have been ably assisted by J.W. Reynolds, T.J. Oneal, L. Risinger, R.J. Gorbett, J.R. Poole, C.F. Renfrs, N.L. Petty, W.H. Spears, E.E. Duffee and Rev. Beck. Pastors' salaries were a thing unknown in this church during the greater part of its existance. J.W. Davis was the last deacon and Miles McCaulou the last clerk elected by the church. The records show that 256 persons have been received by baptism, 77 by letter, 18 by relation and 9 restored, a total of 351. It has indeed been a lifesaving station. 178 have been dismissed by letter, death has claimed 28 and 52 have been dropped for various reasons. The last report to the Association in 1906, gave a membership of 47. The last letter sent to the Association was in 1897 when it convened with the Antioch Church. "Swift to its close ebbs out life's little day. Oh, thou who changeth not, abide with me." We believe it can be truly said of old Brush Creek Church. "She hath done what she could."